Completed ahead of schedule, the new building is a continuation of Prologis’ investment for Arvato Polska in 2016. Including the existing space, Arvato Polska now leases 40,400 square metres at Prologis Park Stryków. 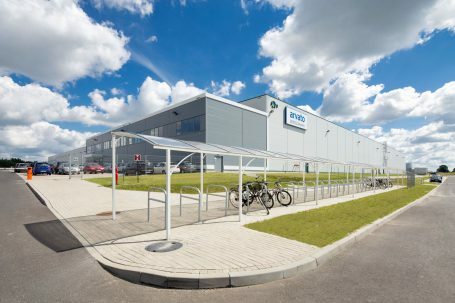 “It is the second building in Prologis Park Stryków that is tailored to Arvato’s specific needs. Satisfaction with our cooperation and the excellent location in Central Poland encouraged the customer to further develop its business in our park. The new facility was built to service Arvato Polska’s fashion industry client. We reinforced the floor, prepared working areas with additional lighting and the construction for a mezzanine installation,” said Ewa Zawadzka, vice president, head of land and development at Prologis Poland. According to Prologis’ sustainable development strategy, the new building has undergone the BREEAM accreditation process. This state-of-art logistics space is equipped with LED lighting and an intelligent smart metering system. The thermal and air tightness testing of the building has ensured maximum energy efficiency. Totalling 40,400 square metres, Prologis Park Stryków is located within one kilometre of the junction of two major motorways – A1/E75 (Gdańsk-Vienna) and A2/E30 (Berlin-Moscow). The road infrastructure ensures a seamless connection with the Łódź metropolitan area and the whole of the country. The park will ultimately total 78,800 square metres.